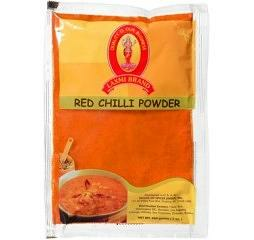 Chilli powder is ground dried chilies. It is one of the most basic and ancient spices used in Indian cooking. It has made its way into many American and other types of cooking. This powder spices up any and every dish, such as meat, poultry, vegetable or lentils. This item in Indian Herbs & Spices category was first added to our catalog on 09-04-2016. Buy laxmi Red Chilli Powder - 7oz (4 Pack), sold & shipped by Desi Wholesale where you can shop online for Quality Indian Groceries, Spices, Dals & Snacks @ Lowest Price.